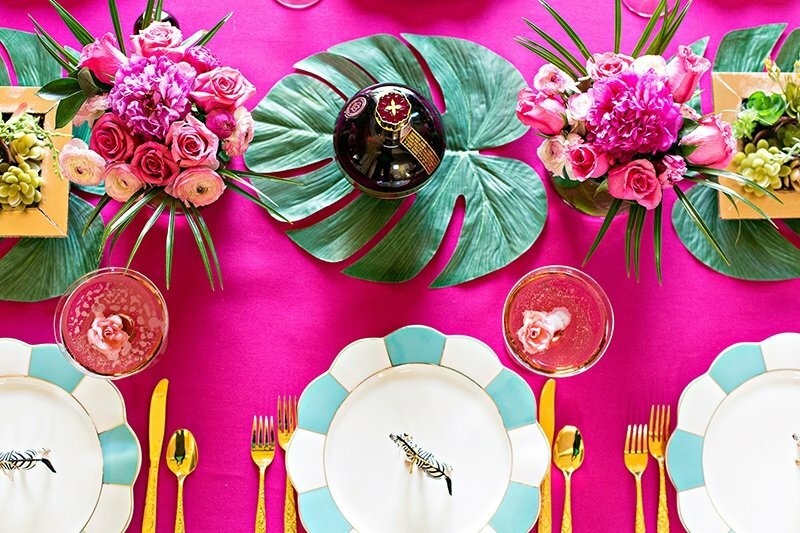 Ever since I wore this raspberry hue to the Golden Globes, I’ve found myself incorporating it everywhere! 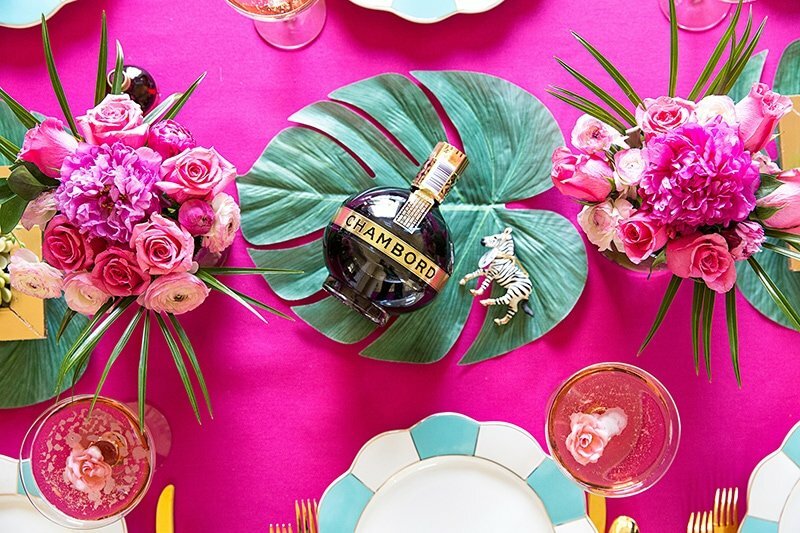 So when Chambord asked me to add a little touch of odd luxury to our Pizzazzerie style, I knew I had to create a tablescape in this gorgeous pink. Why? Because why not! 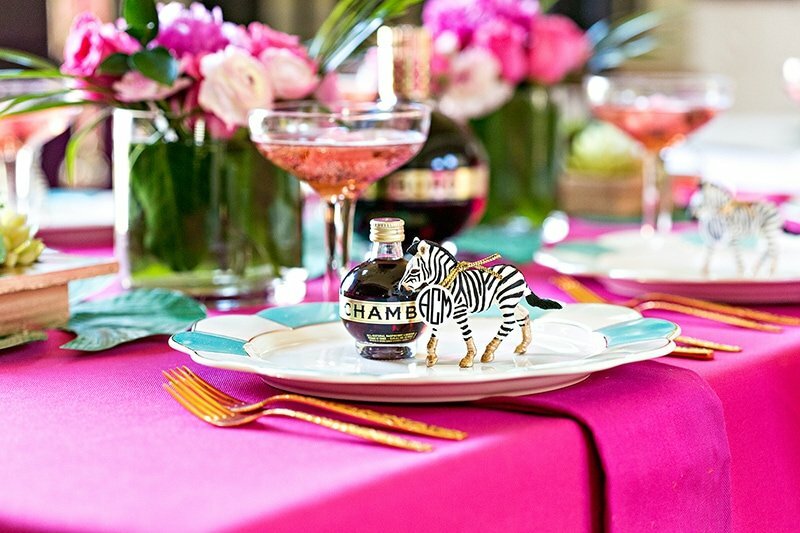 Sipping in style and enjoying a quirky yet colorful party table is reason enough to celebrate, yes? Let’s chat details, shall we? 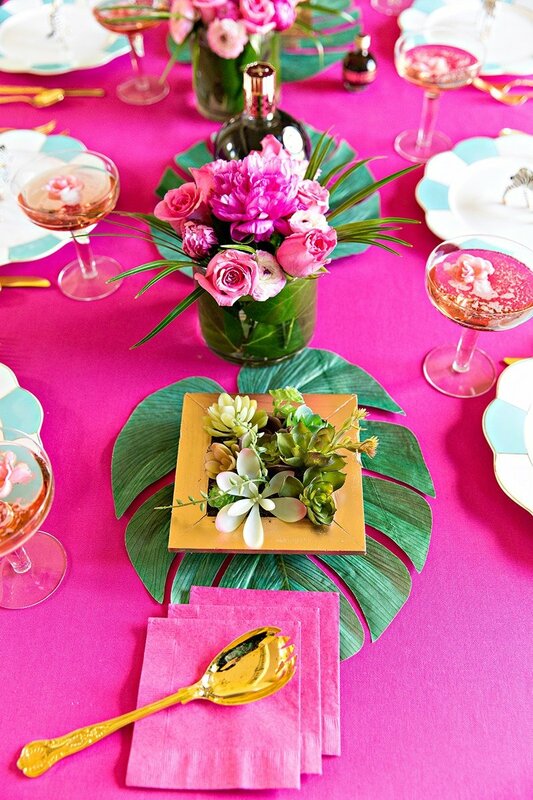 To begin, I started off with the raspberry colored fabric covering for my table. 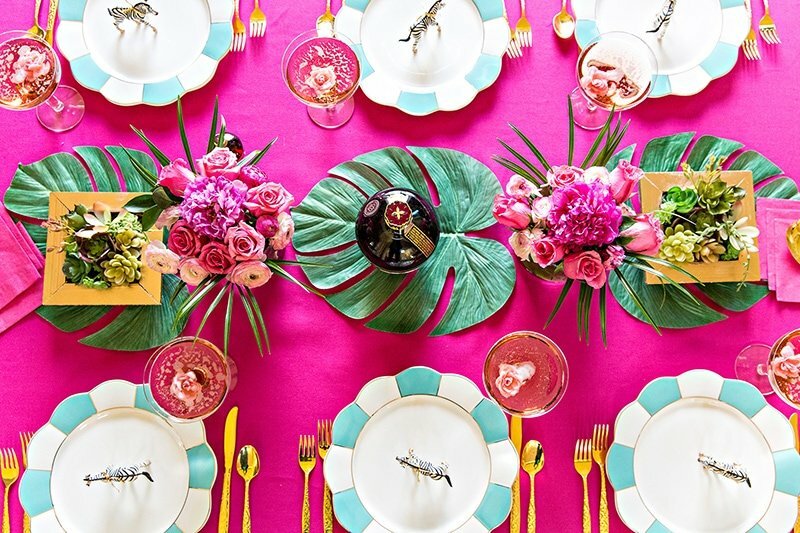 If you can’t find the perfect table covering, visit your fabric store. That’s my favorite place to source table linens. Next up were plates! 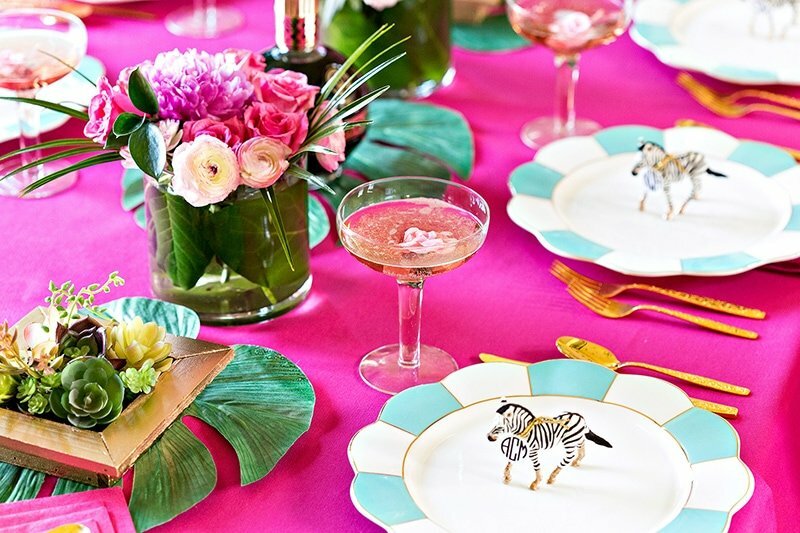 I picked up these gorgeous aqua and white scalloped stripe plates and instantly knew they’d be the perfect pop of color against the pink. 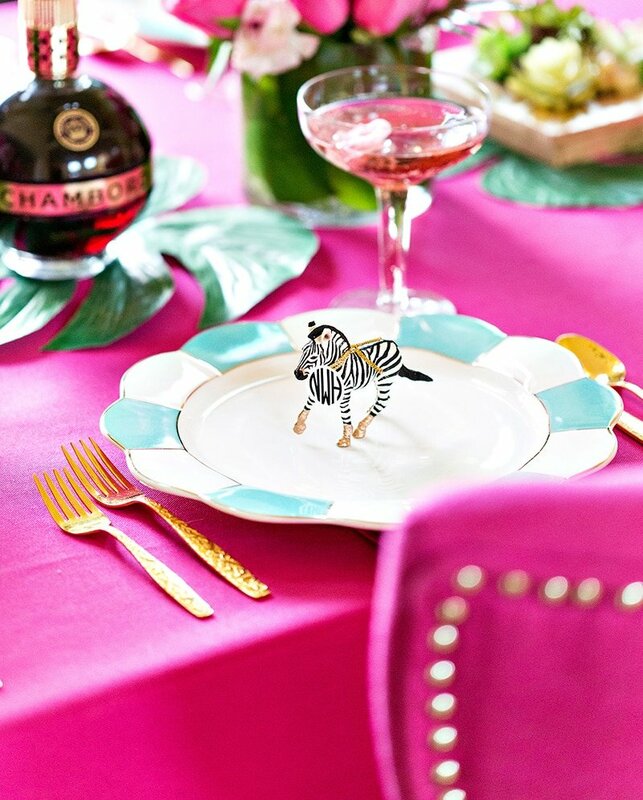 I love nothing more than a fun and unusual little prop so zebras made their merry way onto each place setting. They also served as little place cards with their cute monogram gold tassels. Seriously, these monograms were printed right off my computer in a matter of seconds. It’s the little things, friends! 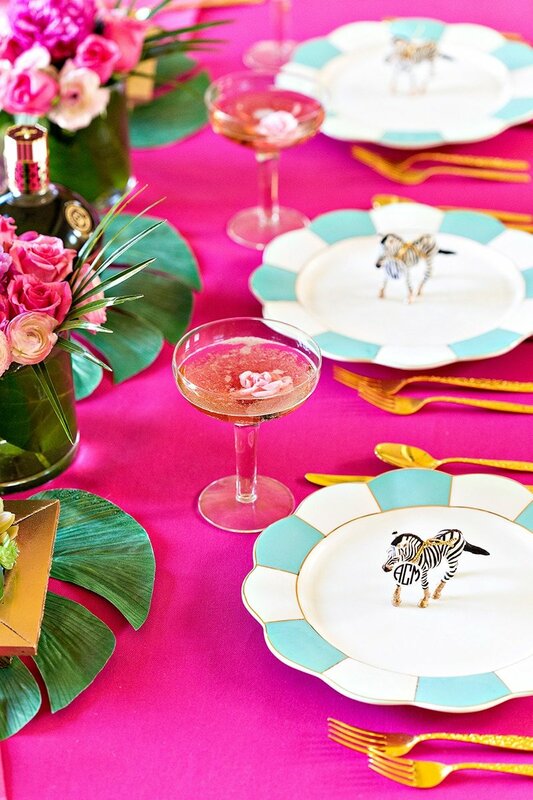 Why not flamingos…giraffes…you name it! Go wild. 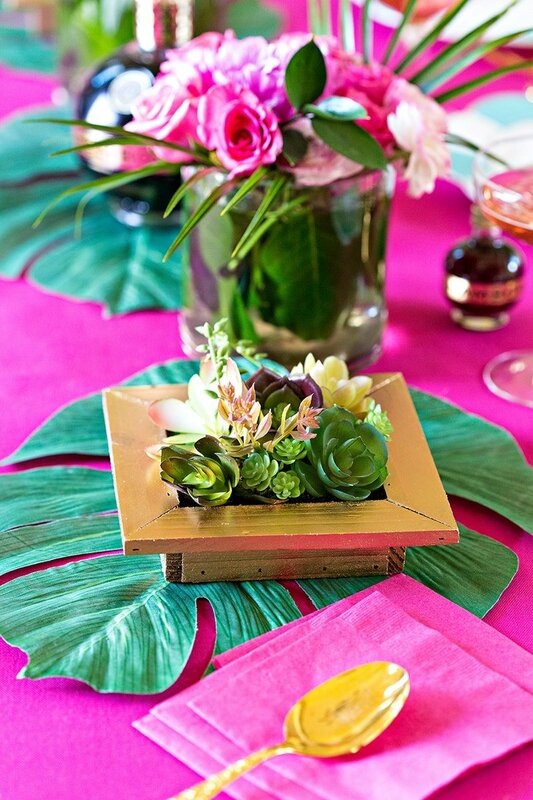 Down the center of my tablescape, I placed large palm leaves for a touch of Pam Beach Regency style and topped with gold succulent holders and a mix of gorgeous blooms. Pink peonies? Yes, mam! 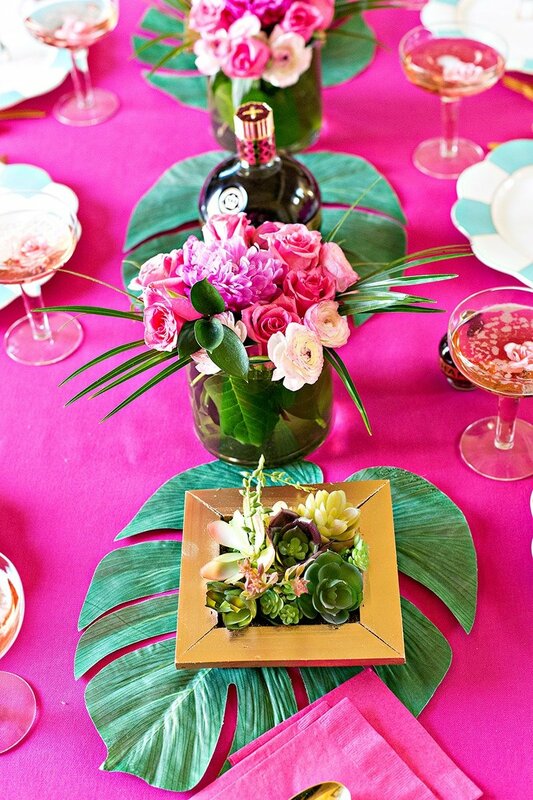 One tip for your vases: use larger leaves around your stems to give the vase a bold green hue all around! 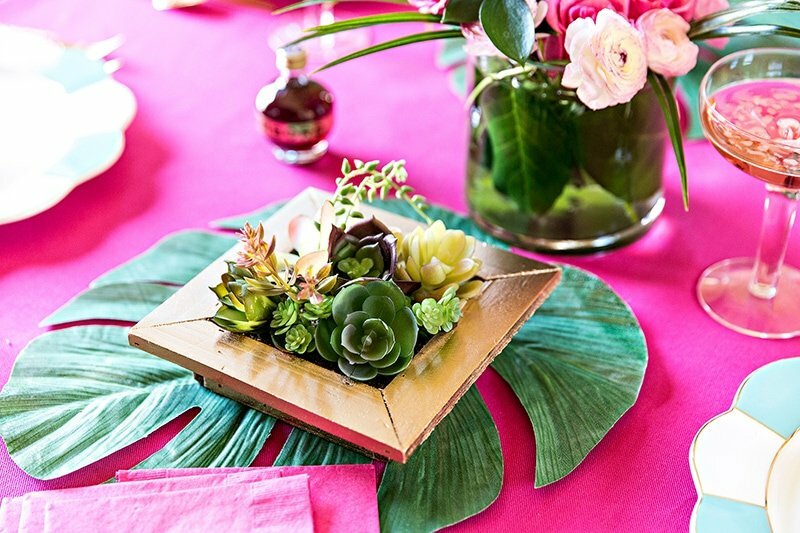 Also, I used gold flatware to tie in with the gold succulent holders. P.S. They were an unfinished wood when purchased. Gold spray paint goes a long way, girlfriends! 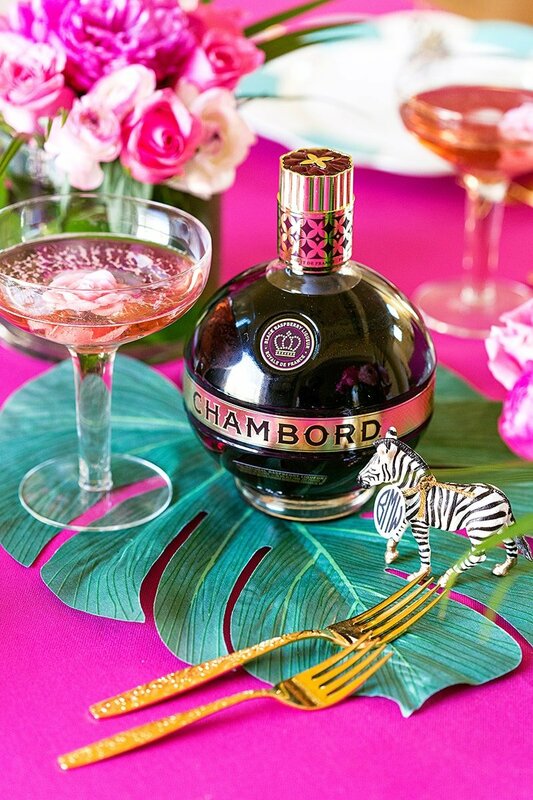 Guests sipped on Chambord and bubbly garnished with a floating flower because why not? 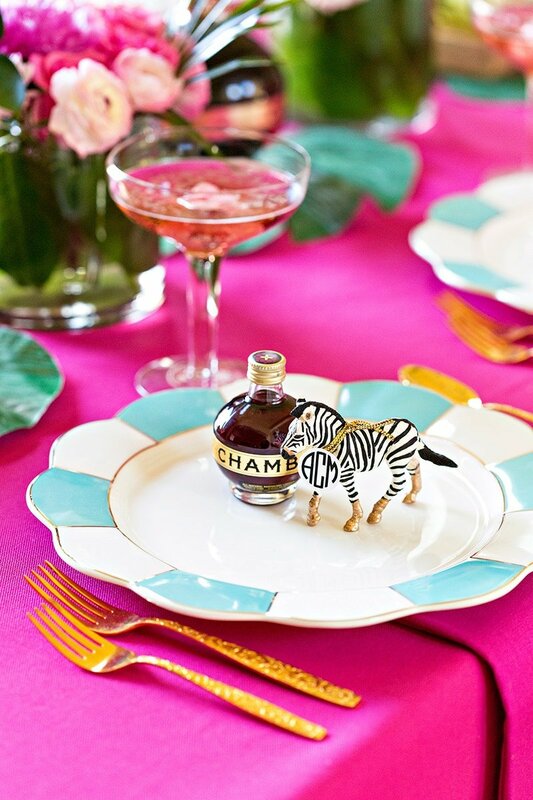 How fun and fancy are those baubles too? 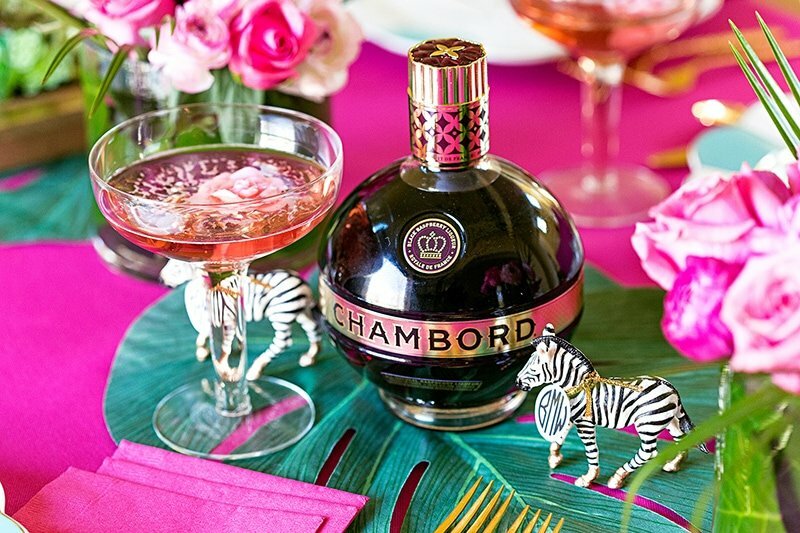 Glassware makes all the difference when you’re sipping a snazzy cocktail. 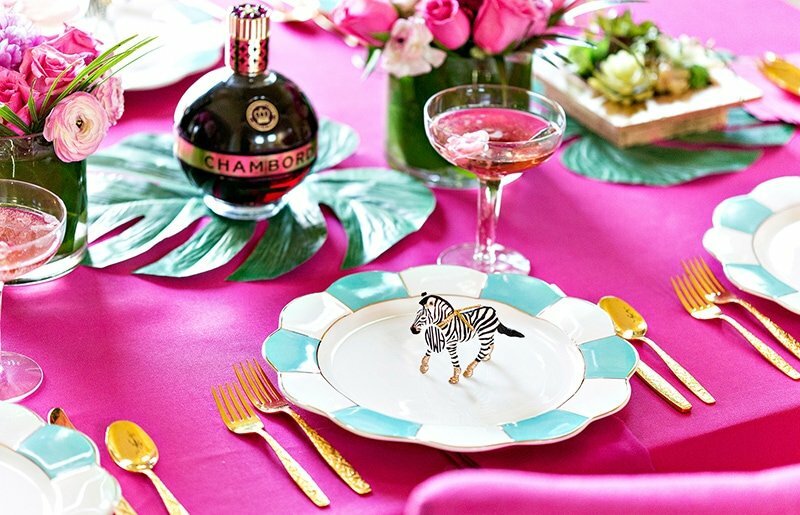 Don’t wait for a formal celebration to recreate this DIY tablescape, friends. 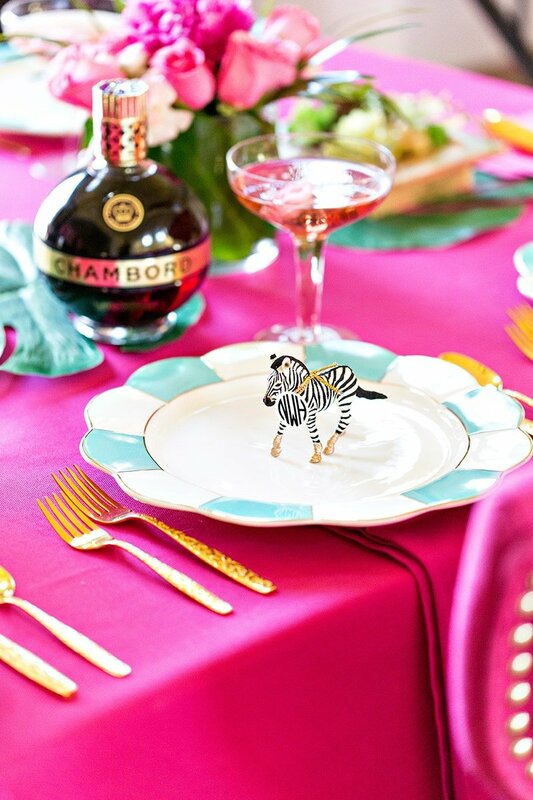 Grab some zebras, get your party dress on, and toast to fabulous style! Today! 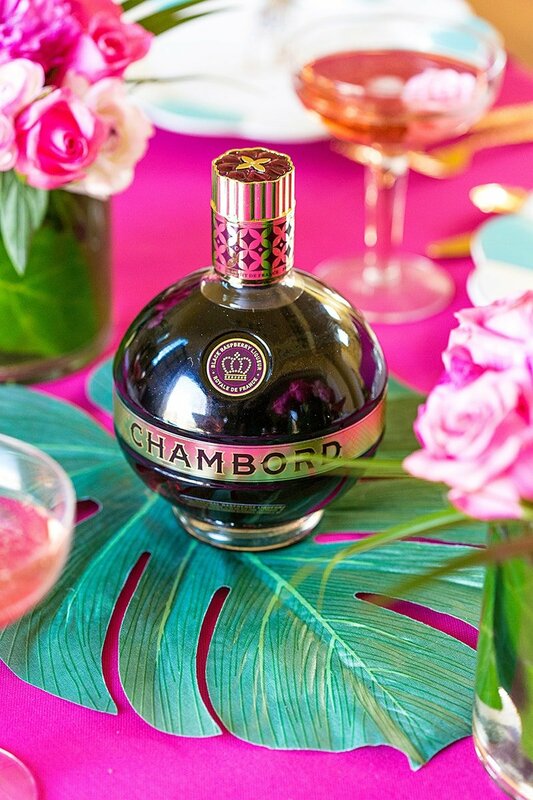 This post is brought to you by Chambord (Brown-Forman Corporation, Louisville, KY, Black Raspberry 16.5%, 21+) & Refinery 29. 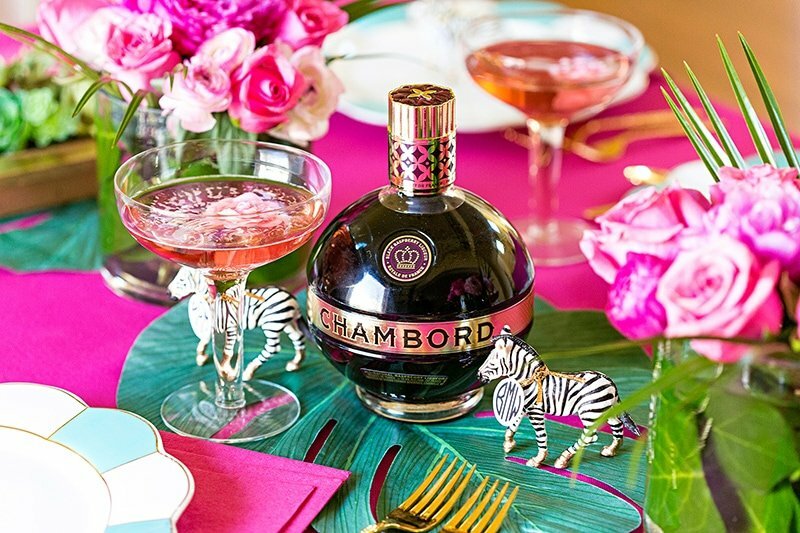 Thanks for supporting the brands that allow us to share party inspiration with you! Chocolate Pecan Pie Bars Recipe & More! 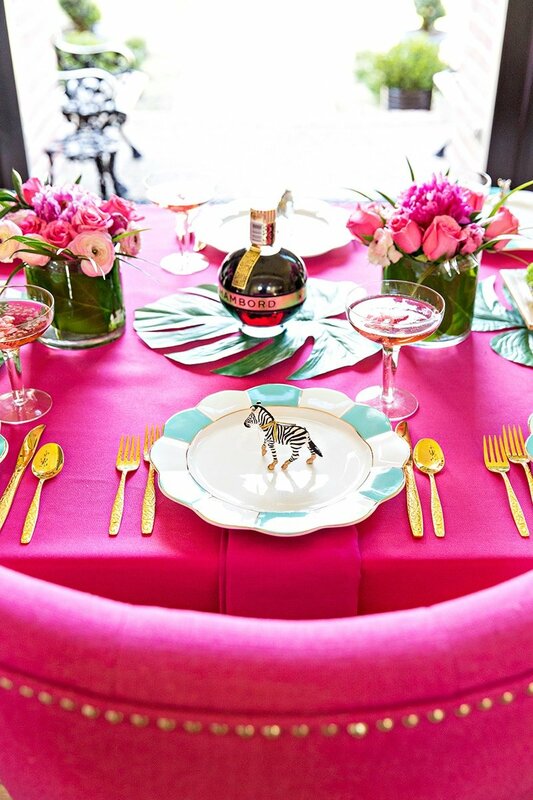 This is the cutest tablescape!!! 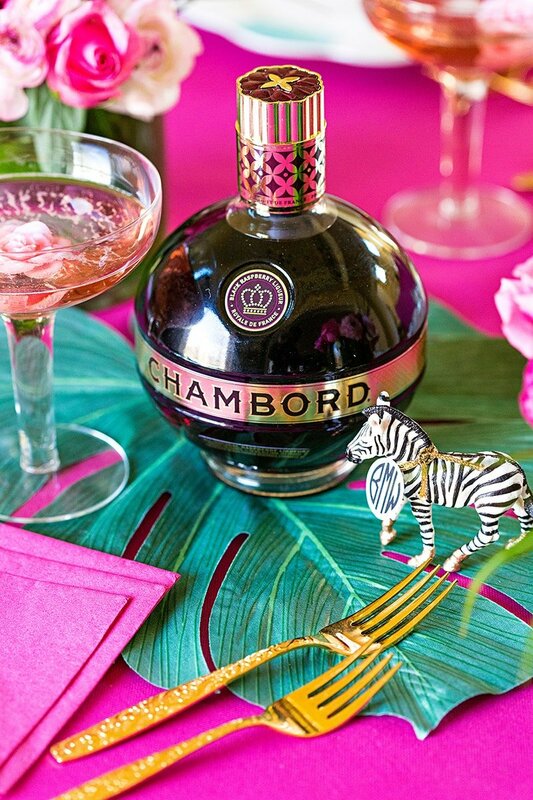 And I love chambord – yum!!! Where can I find those plates? I found these at Homegoods! I have had them for over a year BUT just saw them out again at our local Homegoods so if you have one (or TJ Maxx), check there! Love this so much! Where are the zebras from?! Soo pretty! Where did you find the tropical leaves ?